Take A Pie For SCI | S.O.A.R. Thank you for the opportunity to introduce you to Swift Outdoor Accessible Recreation, SOAR, a 501 C 3 non-profit organization dedicated to helping people with Spinal Cord Injuries participate in outdoor recreational activities. With the information below, we hope to partner with you and launch a viral fundraiser campaign to both spread awareness and raise money for those with SCI. Did you know that the overall suicide mortality rate is five times higher for people with spinal cord injuries than the general population? The emphasis of indoor time spent in front of screens has been correlated with negative psychological and physical effects including obesity, loneliness, depression, attention problems, and greater social isolation due to reduced time with friends and family. SOAR believes getting people with SCI back outdoors can help to rectify this situation. Therapeutic recreation, like the activities that SOAR offers, has a unique role in promoting recreation and leisure as a means to physical, mental, and emotional health and well-being among individuals with disabilities. Therapeutic recreation also reduces pain, depression, stress, and anxiety, and improves cardiovascular functioning, self-esteem, and social skills. The fundraiser is called “Take a Pie for SCI and SOAR”. Essentially, it will be similar to the Ice Bucket Challenge from years ago for ALS. 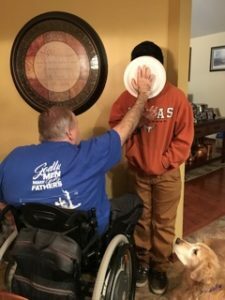 Consumers will have the option to donate funds to the fundraiser for Spinal Cord Injuries (SCI), or they can post a video on social media of them taking a pie to the face. The pies, of course, could be a paper plate topped with Reddi Wip. Share your videos on LinkedIn, Instagram, and Facebook with the tags #SOAR #SCI #Pie4SCI. Email our challenge to your friends and family. We hope you will partner with SOAR to enrich the lives of children and adults with spinal cord injuries and help them to get out and enjoy the great outdoors. Feel free to contact Brian Swift at 708-269-7064. So why would I let that crazy guy smash a pie in my face? Well as some of you may know, one of my Viking and TA brothers broke his neck playing football at age 18. Brian P. Swift was also one of my football coaches at St Laurence. A few years back we reconnected and decided to combine our resources and assist each other in helping others. We aim our focus on Spinal Cord injuries as well as homeless and disabled United States Veterans and all first responders. This particular campaign, Take a Pie for SCI is set up to help SOAR reach their goals of helping others that are disabled and to get involved in outdoor recreational activities. So, please join me in taking a Pie for SCI ….. post your video and donate on the go fund me link below.